Grand Harbour, Malta. Furthest away is the Royal Navy’s aircraft carrier HMS Victorious (R38). In the centre, steaming right to left, is the Italian Navy’s guided missile destroyer Intrepido (D571). 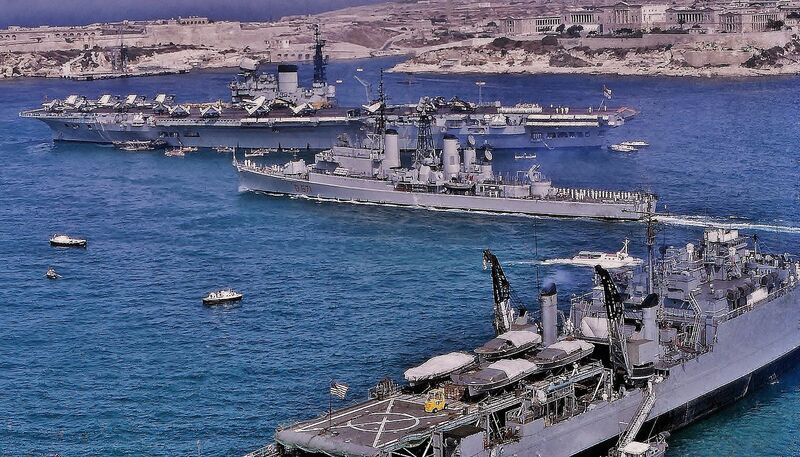 In the foreground is a U.S. Navy Casa Grande-class dock landing ship.. The Royal Navy was the only fleet other than the United States Navy that operated a carrier force immediately after World War II. With six fleet carriers and six light carriers in commission in December 1945 it possessed a much smaller force than the United States Navy. It also had a large wartime carrier construction program that was as yet incomplete. Although much of this program was cancelled with the war’s end, the Admiralty decided to continue building many of the unfinished carriers, ultimately completing two further fleet carriers and twelve light carriers, although many of the light carriers quickly transferred to the service of other navies both within the Commonwealth and elsewhere. The problems associated with jet aircraft operation loomed large in the Royal Navy, especially because its carriers were smaller than those of the United States Navy, exacerbating the difficulties. Solutions were found in the steam catapult, angled flight deck, and mirror landing aid, but on the way a number of more radical options were explored, including landing aircraft without undercarriages on flexible rubber decks, which was tested on the light carrier Warrior in 1948. Steam catapult trials took place aboard the Perseus beginning in 1951 and the angle deck concept was tested aboard the Triumph the following year. The only large carriers to enter Royal Navy service after World War II were the Eagle and the Ark Royal, the two carriers of the Audacious class at the most advanced stage of construction at war’s end. As de- signed, they essentially were substantially enlarged versions of the Implacable class. The Eagle, when completed in 1951, did not differ substantially from the original design but the Ark Royal commissioned in 1955 with a 5-1/2-degree angled deck, steam catapults, a mirror landing aid, and a deck edge elevator on the port side, which did not prove very satisfactory since it served only the upper hangar. The Eagle refitted in 1954-1955 to a similar standard but without the steam catapults or deck-edge lift and then underwent a major re- construction from 1959 to 1964, emerging as the Royal Navy’s most modern carrier with an 8-1/2-degree angled deck, steam catapults, an advanced radar suite, upgraded machinery and auxiliary systems, and an all-missile antiaircraft battery. The Ark Royal, too, underwent modernization refits in the early 1960s and again later in the decade, though it never quite matched its sister’s standard of equipment. Unlike the United States Navy, the Royal Navy did not embark on a wholesale reconstruction program for its wartime carriers to make them suitable for jet aircraft operation. Only one ship, the Victorious, was reconstructed. The project amounted to a virtual rebuild, since the hull was lengthened, widened, and deepened, the machinery replaced, the flight deck rebuilt with an 8-degree angled landing zone, steam catapults, and a mirror landing aid, the superstructure replaced, and a modern radar suite installed. This seven-year project proved so expensive that plans for reconstructing the other five wartime carriers were abandoned and the Victorious remained a prototype. The Royal Navy found its light carriers very suitable for peace- time operation. They were economical, both in terms of operating costs and as far as crew requirements were concerned, and proved most appropriate for service policing the still extensive British Empire. In the mid-1950s the first generation of light carriers gave way to newer ships of the Centaur class that had been laid down late in World War II and were completed over an extended period to an improved design with an angled flight deck and, via a refit in the late 1950s, steam catapults and mirror landing aids. By the 1960s, how- ever, these light carriers were too small to operate an adequate air group of large modern aircraft and two, the Bulwark and the Albion, became helicopter assault ships. The final ship of the class to complete, the Hermes, was very different from its sisters. It had a bigger angled flight deck, more powerful steam catapults, a much updated radar suite, and a deck edge elevator to port. The Hermes, too, transferred to assault duties in 1971, became an antisubmarine warfare ship in 1977, and then was refitted to operate Sea Harrier VSTOL aircraft, using a ski-jump ramp at the forward end of the flight deck to launch these aircraft. In 1959 the Admiralty began planning for new carriers since the late war generation of ships that formed the carrier force would need replacing by the early 1970s. This process took place in a rather unfavorable climate: there were very stringent fiscal constraints from the Treasury, the Royal Air Force was opposed to the emergence of a powerful attack carrier, and there was strong political pressure to minimize the carrier’s size. These constraints forced some unusual approaches to the design of what became known as CVA-01. The flight deck was offset to port and incorporated only a shallow angle for the landing area. There was a wide passageway to starboard outside the island to allow movement of aircraft without interfering with the deck park. The hangar had an opening at its after end to allow aircraft to run up their engines inside the hangar. Two elevators (of a novel “scissors” type) linked the hangar to the flight deck, which carried two steam catapults and had water-spray cooled arresting gear. The power plant was sufficient only for 28 knots and used a three-shaft arrangement, similar to that seen in the Illustrious class of 1940. Armament: 1 twin Sea Dart SAM launcher, 2 quadruple Sea Cat SAM launchers. Detail design work began in July 1963 but the entire project was cancelled in February 1966 when Secretary of Defence Denis Healey’s Defence Review determined that the Royal Navy should give up its fixed wing carriers and transfer the aircraft to the Royal Air Force. This decision not only ended plans for new carriers (two were envisaged) but also led to a rapid run down of existing carrier strength. The Royal Navy continued to require a seaborne aviation capability and, in 1967, began design work on a helicopter-carrying com- mand cruiser using a gas turbine power plant. This was essentially an updated version of the Tiger class cruisers with missile and gun armaments forward and hangar and flight deck facilities for helicopters aft. It soon became apparent that a more efficient vessel would result from moving the superstructure to the starboard side and constructing a through flight deck from end to end of the ship over greatly enlarged hangar and workshop spaces. The design of the resulting through-deck cruiser was unusual in its capacious internal volume, a result of extensive use of alloys for construction and the elimination of most armor protection. This large internal volume al- lowed the incorporation of extensive modularity into the arrangements of machinery and workshop spaces. Almost all machinery and auxiliary equipment was designed to be maintained on an exchange basis, with modules being removed for repair and maintenance and replaced by new units. The modular arrangement of workshops also allowed great flexibility in operation, since new workshop blocks could be embarked to suit different air groups. The through deck cruiser received an additional boost with the advent of effective VSTOL fighters in the form of Sea Harriers. Operations with these aircraft did not require catapults and, as a result of experiments at the Royal Aircraft Establishment in Farnborough, the design also received a 7-degree ski lift jump at the forward end of the flight deck, which allowed launching Sea Harriers with a short takeoff run with much heavier payloads. Just as these ships entered service they were officially reclassified as support carriers, and proved very useful in operations in the South Atlantic, Adriatic, and Persian Gulf. In July 1998 the Defence Review included provision for the addition of two conventional aircraft carriers to the Royal Navy. Details of the design are still unclear but best estimates are that the new carrier will be 945 feet long with a beam of 125 feet and a flight deck width, depending on whether it features an angled deck or not, of 210 or 270 feet. The power plant is to be four Rolls-Royce WR21 intercooled recuperative gas turbines driving shaft-mounted electric generators for both ship propulsion and service power. At present, the navy anticipates operating an air group primarily of American F- 35 Joint Strike Fighters along with large antisubmarine helicopters as yet undefined Maritime Airborne Surveillance and Control plat- forms, for a total of about forty-eight aircraft. This air group would not require catapults or arresting gear but provision for this equipment is to be incorporated and a contract has been assigned for de- sign of a novel electromagnetic drive catapult. These two 60,000- ton ships are programmed to enter service between 2012 and 2015. Although the Royal Navy’s aircraft carriers were equipped with reasonably modern aircraft, it was not until the early 1960s that they deployed an effective strike aircraft, the Buccaneer. This was a reflection of the primary mission of British carriers in the early Cold War era, imperial policing. By 1966, as Britain’s imperial commitments contracted, it was clear that its finances would not allow the deployment of large attack carriers analogous to those of the United States Navy, not least because of the costs entailed for their air groups. The primary roles of British carriers became operations in the littoral and antisubmarine warfare, requiring rather different vessels. The Royal Navy’s adoption of VSTOL technology endowed its carriers with greater flexibility and operational effectiveness within the limits of its mission profiles so, despite the British origins of the angle flight deck, steam catapults, and mirror landing aids, its new Cold War-era carrier designs have been somewhat outside the mainstream represented by the big American ships.